Many authors and publishers who have scanned their own publication and submitted it to various vendors for optical character recognition (OCR) find that the resultant converted files are a formatting nightmare. Old cookbooks, for instance, often cause OCR problems due to the use of fractions in the measurement of ingredients and the prevalence of formatted tables to display recipe content. Several of our clients have found that after our accurate conversion process three or four separate books could be combined into a single streamlined file. Many clients request that their scanned publication is first converted to Microsoft Word format, as this allows them to update the text with new photos, acknowledgments ,and edits. After our client makes the changes to this file, they can send it back to us to be converted to PDF or Kindle format for sale through an ebook store. Email us the scanned file. If the file size is too big, we can download it from your website or else we provide an FTP address (file transfer protocol) to the client to upload the file on our servers. After reviewing the file, we will inform you of the total conversion cost (Microsoft Word or Kindle conversion) as per your need. We will also provide you the details on the time required for conversion and conversion restrictions (if any) based on your output conversion format. After the payment is received, OCR (Optical Character Recognition) is performed on the converted book. The client is emailed a secure login ID and password for previewing the book on Kindle and asked to review the file for any changes. conversion standards in mind) until the client is satisfied with the final output. After the final review, we will send you the final file, which you can then upload to your Kindle account. After you publish the file in Amazon.com, your ebook is available for sale 72 hours. 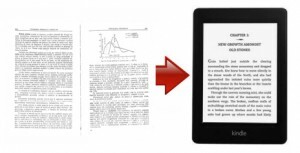 Next steps for you to convert your Print to Kindle format. We convert scan to kindle for authors, publishers, and copyright owners. If the book is no longer copyright protected please provide us with the full publication details. If you have any questions, feel free to contact us at Bob@itglobalsolution.com or call Bob Mehta at Supremus Group at (515) 865-4591. We can convert from any format to the format of your choice. Your ebook conversion solution is just a phone call away.